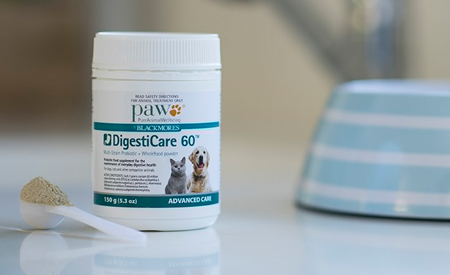 PAW DigestiCare 60 is a multi-strain, multi-species probiotic & wholefood powder for the maintenance of everyday digestive health of dogs. DERMagic products can be used individually to excellent effect. But for severe cases of dryness & itchiness DERMagic recommends this 4 step process get relief for your pet (and you). The Recovery Suit prevents damage from scratching & biting and also greatly limits contact with allergens. 94% cotton 6% lycra, it’s made of a comfortable, breathable, lightweight, four way stretch fabric. 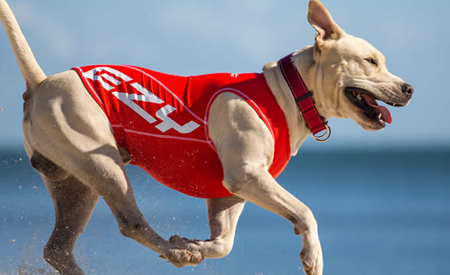 The EzyDog Rashie provides coverage for your dog’s torso from allergens (as well as 50+ UV Protection). 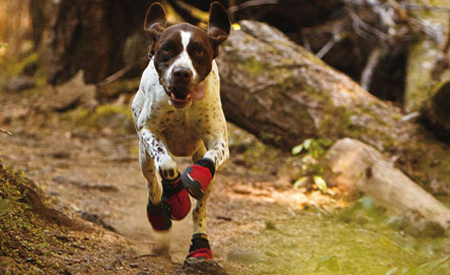 Ruffwear Grip Trex Boots offer great protection for sensitive, irritated paws. They prevent contact with allergens while allowing max breathability with a strong mesh upper. 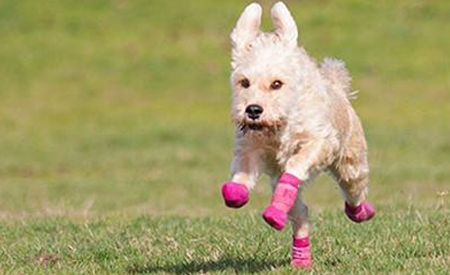 Made of soft quality cotton/spandex with an anti-slip wrap around silicone sole, Pawks Indoor / Outdoor Dog Sports Socks keep your dog’s paws safe from contact allergens outdoors on walks and during play. The Recovery Sleeve provides excellent leg coverage. It prevents damage from scratching and biting and also greatly limits contact with allergens. Dogs are like superheroes. They face dark times with courage & humour. But if there is one thing that can change your canine into a raving maniac, that thing is itchiness. Allergies are the kryptonite of the canine world. Unfortunately they are all too common. I wish I could wave a wand and make all canine allergies disappear. I can’t. But there are definitely ways we can help! Read on to find out how to stop that blasted itch. Does your dog itch, lick, scrape & gnaw at his skin in a frenzy? Your dog may even be driven batty and keep at it until there is an open wound. Over 70% of skin conditions in dogs are estimated to be allergy related. The other most common reason for scratching is dry skin. You can determine if your dog has dry skin with a quick examination. Part your dog’s hair and have a look. Do you see dandruff? Is the skin cracked or tough? This is a great indication of dry skin. If it’s dry you need to moisturise your mate! 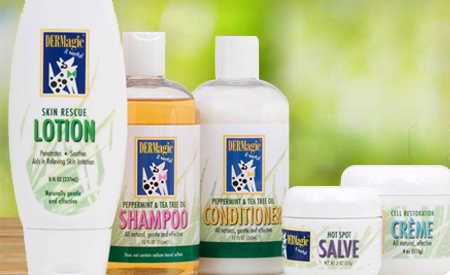 DERMagic Shampoo & Conditioner are a great place to start. If the skin isn’t dry the likelihood of allergies is high. Unfortunately lots & lots of things do. A very common allergen is grass. I know. How unfair! Other frequent allergens include fleas, flea control products, food ingredients (like beef, chicken, pork, corn, wheat or soy), mould, dust, and cleaning products. These allergens can be tough to avoid – unless you keep your dog in a plastic bubble! And determining which allergen is making your dog miserable can be a serious conundrum. We do have ways to stop that blasted itch! Research into canine allergies identifies a strong link between dog’s skin health and diet. Gut health is essential for full body health. If your dog suffers from allergies take care of the gut. Try giving your mate a good Probiotic to keep a healthy balance of flora in the digestive tract. This can definitely help. And it can’t hurt. Also heaps of allergens can be found in dry processed food. Give your dog a healthier new diet and you may well see a new dog! Many people have had great success moving from processed kibble diet to raw meat. 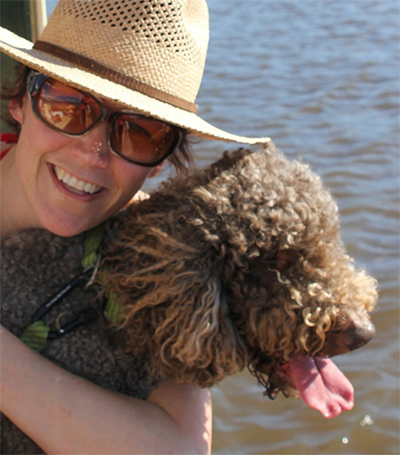 Here’s some more info on diet from animal nutritionist Alla Koegh. With a bit of magic the BLASTED ITCH can be stopped! DERMagic is a range of topical treatments to soothe itching, clear skin and stimulate the healing process.These all-natural skin care formulas use ingredients including certified organic whole-leaf aloe vera gel, Vitamin-E, lanolin, beeswax, and soothing natural oils to achieve amazing results. And the feedback from our customers is amazing! DERMagic can be used as a four treatment process for severe cases or products can be used independently to sort out less serious issues. # Peppermint & Tea Tree Oil Shampoo and Conditioner eliminate odours, stimulate healing & restore dry itchy skin. # Skin Rescue Lotion relieves dry itchy skin, boosts immunity and speeds up cell regeneration. # Hot Spot Salve heals hot spots, minor wounds, insect bites, localized allergic reactions and itchy or inflamed areas. # Restoration Creme keeps your dog’s skin healthy, hydrated and soft. # If your dog has itchy bits from a contact allergy you can prevent that contact. 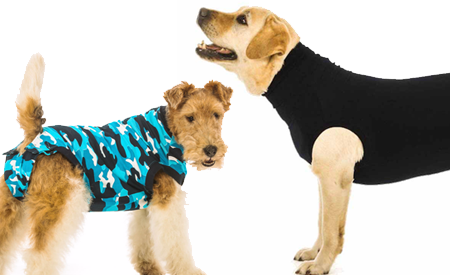 The Suitical Recovery Suit covers and protects the whole core of your dog’s body. It’s a comfy fit too, very breathable and stretchy. # If your dog is just needing some chest coverage an EzyDog Rashie can do the trick. # For those poor dogs with crazy itchy paws, Ruffwear Grip Trex Boots can protect the paws from excessive chewing and contact allergen. They’ve got a breathable mesh uspper to allow for breathability. # For inside use you can cover those paws up with Dog Socks to keep your critter from gnawing at them. Keeping the affected area unexposed and dry will get the healing happening. 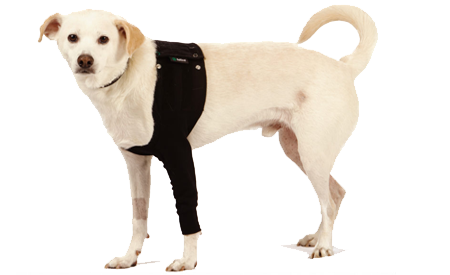 # If your dog is having itchy issues on the front legs try out the Recovery Sleeve to keep these areas safely covered for healing. 4. NEED RELIEF NOW! GOT ANY APPLE CIDER VINEGAR ON HAND? Here’s something you can do straight away if you’ve got the right ingredient. Mix an equal amount of warm water with apple cider vinegar. Apply it to your dog’s itchy bits. Rub it on or apply it in a spray. Careful around the eyes! The natural acidity of the cider can be very healing. For a longer term plan you can add up to a tablespoon of unpasteurized apple cider vinegar to your dog’s water or food. Start with a small dose and work your way up. Smaller breeds will require less than larger ones. Doing this every day can help treat dog skin allergies from the inside. Apple cider vinegar is naturally antibacterial and can improve a dog’s overall health when added to its food or water. I hope this post reaches those who need it most. I want to do whatever I can to alleviate allergy related suffering in our beautiful dogs. It’s the absolute pits! Try any of these items out and there’s nothing to lose because you’ve got 100 Day Easy Returns. If you don’t see results just send your purchase back to us in new condition and I promise to refund you completely. I want you and your dog to be happy. And I don’t want you keeping things just because you bought them. They have to work! If you have any questions or want to have a chat about which option to try with your dog just give me a ring on 1300 725 781. I’m here to help! As always, all the best to your pack! June 14, 2017 | Filed under Canine Health, Uncategorized.